Footpath Holidays, a family-run business, has been organising top quality walking breaks for the past 35 years, and has built up an enviable reputation for professionalism, customer care and (above all) enthusiasm, friendliness and approachability. Ian and Suzanne Newman live in and work from the tiny village of Norton Bavant, in the heart of rural Wiltshire, and enjoy nothing better than to share their knowledge of, and life-long enthusiasm for, the British countryside with guests from both home and abroad. Suzanne has walked and mountaineered throughout Britain, as well as the Alps and Pyrenees. Ian gained his mountain leadership certificate in 1987 and has walked and mountaineered extensively in Britain and worldwide. For the last two years, daughter Heather has been involved in the set-up adding a 'third generation' to the family involvement. Footpath Holidays guests seem happy too, with many returning time and time again. Several guests have now exceeded one hundred walking breaks, and some have taken a holiday every year since 1983! We live and work in the village of Norton Bavant in the Wylye Valley. The West Wiltshire Downs rise on either side of the valley, and to the north lies Salisbury Plain, a large expanse of open grassland which provides a training ground for the British military. Stonehenge is ten miles to the west. Bath is situated 25 miles to the northwest and Salisbury a similar distance to the south east. The picture at the head of this page looks down onto the village of Norton Bavant from the tumuli (ancient burial mound) on top of Cotley Hill. 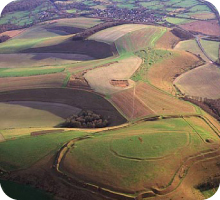 The aerial picture below shows the ridge of hills of which Cotley Hill is a part. The battlements of Scratchbury Iron Age hillfort can be clearly seen in the foreground. Norton Bavant village is fractionally off to the right, by the corner of the large wedge of trees. "The air must be of the best in the world, and the country singularly bright and beautiful”.